I'm at the Talisman Gallery! I am so honoured to be part of this show. 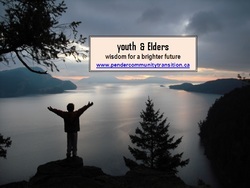 Eve Pollard is a fabulous Pender Island photographer. I've always admired her work for the quirky and exciting way she captures subjects. So when she invited artists to interpret her work, including me, I was over the moon! 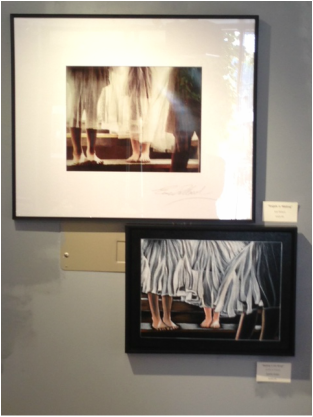 I chose three photos to play with, and all three of my interpretations are in the show. It was a rich experience for me. I never paint from photographs. I usually use my mind's eye, my imagination to draw my imagery from. But this process was brilliant for me! Thanks Eve!! Go check this show out if you're on Pender Island. Below is my interpretation of Eve's photo to the right. My painting is the Upper Left piece. 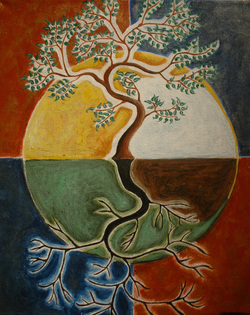 Below is Eve's photo and my painting. So another art season is here! 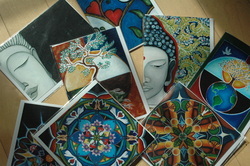 I have 6 new art cards to add to the collection. I have had a very busy winter painting, with over 40 new pieces. Not bad for a busy, homeschooling mom! I have a couple shows coming up. The second year of "Art in the Orchard" is happening again this year and I will be showing my work there. This event happens on the last weekend in July at Corbett House. It is a collection of Pender artists and musicians, with tea and snacks under the apple trees! Port to Starboard Studio tour happens the August long weekend. A great opportunity for me to show the cross-section of my work. 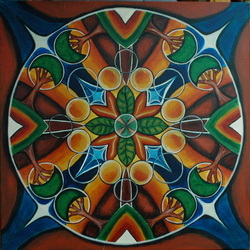 I will have a few pieces in the Talisman Gallery in mid-July. Stay tuned for more details. 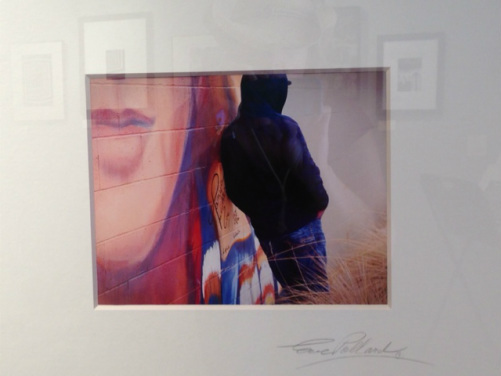 Local photographer Eve Pollard has invited a handful of Pender artists to interpret her photographs. Very fun! My paintings are finished and I am excited to be part of this show! And last but not least, there is the Saturday Farmer's Market. I will have a table there throughout July and August. Always a great way to spend my morning! "Art in the Orchard" at historic Corbett House. Saturday, July 28th 12:00 to 5 p.m. Come and enjoy my artwork along with other island artists for an afternoon of tea and music, and local art under the apple trees! I am so honoured and thrilled to be a part of this. Ten studios (including mine! ), 14 artists including paintings sculpture, quilting, wood-working, pottery, photography, jewellery and music. Last year the neighbourhood event was a huge success and lots of fun for folks who enjoyed walking from house to house. "Verse and Vision" August 10th, 11th & 12th at the Community Hall. Three days of music and art featuring artists from Pender (yes, me included! ), Mayne and Galiano Islands. 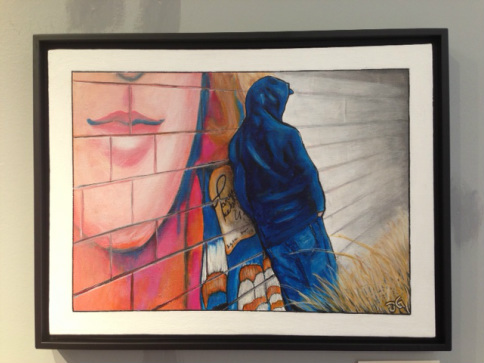 “Verse and Vision” a written word and visual art show. Friday evening reception. Saturday 1-5pm local artists showcase along with musicians and dancers. Big House Voodoo playing on Saturday night. Sunday art show and concert. New order of art cards have arrived! Message me if you'd like some! A big shout out to Art Ink Print (below) for making them so darned purdy! Cards are blank inside but on the back they have a beautiful quote that captures the essence of the art on the front. Thanks to Art Ink Print located in downtown Victoria, B.C. for my professional and beautiful looking art cards. Looking for high-quality and friendly service for your printing needs? Then this is your place. Thanks Scott! 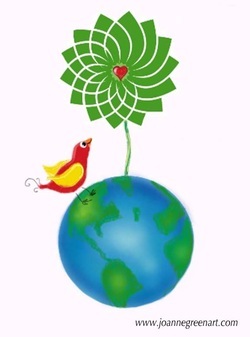 (www.artinkprint.ca). As I get rolling along here, I will be making larger prints. Stay tuned! My art cards are now available at the store Uniquely Yu located at the Driftwood Centre on Pender Island, B.C. I will also be at the Farmer's Market starting in June! February 2012 brings me back into the studio after a 4 month hiatus. I've been focussing my free time on my health and fitness again. In the scope of my life as a full time home-schooling mom of two, there is little extra time. For the last two years most of my free time has been spent painting, and as a consequence not placing as much attention on my health. Exercise is a critical piece in my life- keeps my body strong and my spirits lifted. Finding balance in a busy life is such a journey. Now that I'm back feeling strong and healthy, I want to bring this energy into my art and onto the canvas. 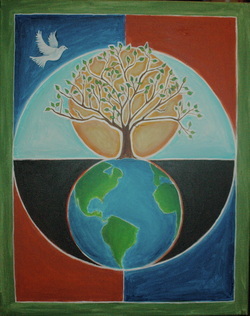 My latest painting is seen here on the left, inspired by an organization that I'm interested in called Treesisters (www.treesisters.org), a movement where women are coming together and reforesting areas of the world and promoting sustainable living. I have an art show coming up this summer in August, and so let the painting begin! My art cards have been sold out and so I shall be ordering more and making new ones too. 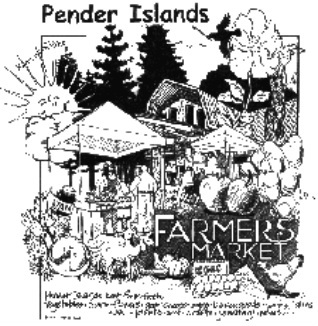 August and September at the Pender Island Farmer's Market! I kicked off August with a table at the Pender Island Farmer's Market. I am selling my art cards and decorated matchboxes AND taking print orders. I plan to be there most weekends through August and September. Yesterday many of my fellow islanders were surprised to see me there. "Wow, we didn't know YOU painted!" Heard that a lot. Yep. I think we all better get used to it. July 30th and August 1st, 2011. My neighbourhood is having an open house studios tour. Seven artists including my own are opening up their doors for a two day event. Today was day one. It was exciting for me to display ALL of my paintings. Plus, I am excited to have new art cards made and ready to sell. They are lovely. Kudos to Scott at Art Ink Print in Victoria for walking me through this process and really getting me and my style (http://www.artinkprint.ca). Check out my 'store' for a closer look. And maybe to order some? These art card images are also available in prints now. Cool. It's election time and I know who Red Bird is voting for. My heart is cracking open for the people of Japan. The video on the news is unbearable. In times of world grief I often sketch on my computer tablet. In particular, I sketch this Red Bird with yellow wings. 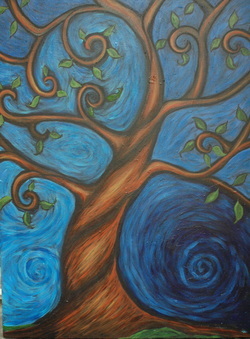 She made an appearance in one of my paintings too (titled "Hope Floats"). I drew her a lot during the BP Oil Spill Crisis. 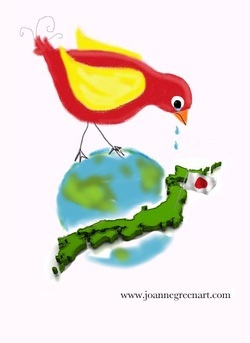 Today I pray for Japan. My selection of paintings on weekend two. The first weekend's selection of paintings on display. I have been dabbling in video editing for a while. I've done a few memorial slide/video presentations, and a couple of wedding slideshows. I collaborated with Ethan Smith, author of "Building an Ark" and put together his video presentation for his book tour. My husband and I dream of making documentaries together. He has a background in film making, and I have a dream of having a voice, louder than what I can express on the canvas. It would seem THAT our documentary-making dreams may be taking shape. The next couple of months will be exciting times for us. In the meantime, my daughter and I spent only an hour, from start to finish on this little project. It was so fun that i am now doing a stop motion painting experiment. I'll post once it is done. For now, here is our little 'movie' called "Love Grows"
I am excited to announce I've been asked to put some of my work in the 3rd Annual Mosaic Festival on Pender Island. Yes, this is my first public showing of my art, beyond my Facebook community. It is happening on February 5th and 12th, 2011. It is a showcase of 19 other visual artists as well as storytelling and musical performances. Here's the link to the Mosaic Festival. Come on out if you are on Pender!! I have recently sold some paintings (YAY!) and have completed two commissions. I am learning that commissions are not my style (yet). The moment I accept one, my creative process shifts into new territory, not at all comfortable. So for now, I'm going to settle back into my comfort zone and paint away. Currently, I am looking into getting prints made.